Not only does today mark the 100th Day of my 100 Day Resolutions, but it also marks the completion and success of Blogmas and my final post of 2014! A couple of days ago, I found my notepad containing notes about participating in Blogtober and what I wanted to do for me 100 Day Resolutions and it feels like I only wrote it one month ago, not 100 days ago! I remember sitting on the sofa in the conservatory, curled up under my blanket while having a brainstorm. And now, here we are on the other side of it. Is there anything out there to make time slow-down?! Anyways, here is my final Happy Days post. So another 10 days has passed and, as much as I hate to admit it, I feel as though you should all know I am currently in bed with a massive cold. Yep, I managed to get ill less than a week before Christmas. I got ill about two days ago, primarily with a sore throat and a bit of a cough. However, that has now subsided into a humongous cold which consists of a runny nose and a stuffy head so I am sniffing a lot and inhaling tons of Vicks and I just can’t seem to get relief! Are any of you feeling unwell or am I the only one? Regardless, I knew I couldn’t abolish my Blogmas streak of posting for 21 days in a row so here is my 22nd post this month, my happy points for the past ten days. To think that we are 80 days into my 100 Day resolutions is scary. It doesn’t feel like it was that long ago that I set myself the resolutions so to be 4/5 of the way through it is mind-blowing, though these posts are a good way of keeping track of the time! So, without an incredibly long introduction, here are my happy points from days 71-80. It is December 1st today, which obviously means Christmas is coming up very soon but I still cannot believe that we are on Day 70! 70 Days already, it has simply flown by. 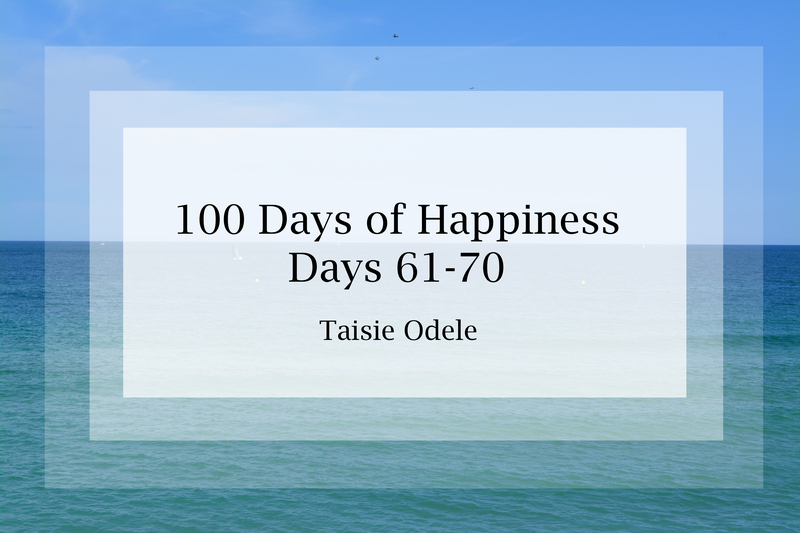 Anyway, here are my happy moments from days 61-70. If you follow my blog, you might notice that I have been a bit absent recently. I have been very occupied with work, family life and my personal life recently and as such, I feel like certain areas of my life – including my blog – have suffered. You can definitely tell that this is the case when you realise that today is actually day 64 of my Happiness Challenge and I should have posted my 51-60 update last Friday! However, I am endeavouring to get back on track with my blog and my life, so here is my 51-60 update. The past ten days have gone simultaneously very fast and too slow – a lot has happened in the past ten days yet at the same time, it doesn’t feel like it was two days ago since I was writing my last 100 Days post. Anyway, here is my latest 100 Days of Happiness post! When did November happen? And when did October finish?! I have zero idea where the past few days have gone but it would appear that it is time for another one of my 100 Days of Happiness post.